If you're Microsoft Windows operating system user and using Laptop or Notebook as your primary machine in professional and personal life than you need to be sure Which Laptop/Notebook is Best Performing and Most Reliable for Windows Operating Systems? Operating Systems includes Windows XP, Windows Vista, Windows 7 and Windows 8. We are sharing an Infographic and a research report conducted by "Soluto" which shows data till April, 2013 based on Most Reliable and Best Performing Windows Laptop/Notebook for professional and personal usage. Microsoft and its Laptop/Notebook Maker partners are trying hard to make newest Windows 7 and Windows 8 OS stable and reliable as much as possible in terms of Least amount of crashes, bugs, lags, hangs, errors like "Blue Screens of Death" etc. etc. but Windows OS users will be shocked and also pleased to know that Apple's MacBook Pro 13, mid-2012 is the Most Reliable and Best Performing Windows Laptop/Notebook which gains number-1 position with the least score of 1.05* in terms of least amount of crashes, bugs, lags, hangs, errors like "Blue Screens of Death" in test experiments and on number-2 position its Acer's Aspire E1-571 Laptop with the least score of 1.12* and on third position its Dell's XPS13 Laptop with the overall score of 1.28*. 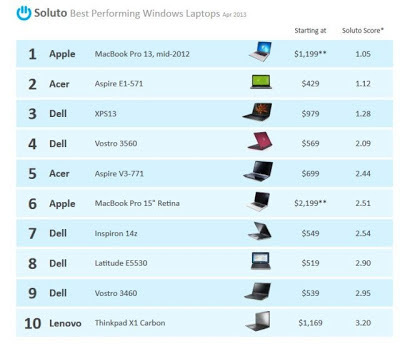 You can check-out full report and study in following Infographic based on Top Ten (10) Best Performing and Most Reliable Windows Operating System Laptop/Notebook with the comparison of starting price tag.